The pre-order offer on our great first codes in the new Hordes of Buildings (HOB) range is now finished. I would like to thank everyone around the world from Scotland to Australia and everywhere else for their support and custom. So many kind comments and encouraging words it means a lot to us here. We have taken the buildings off of our website for the moment before their full release in a week or so in time. We are shipping out the pre-orders from today and expect to get the last of them out next week as we had such a large response in the last twenty four hours. Above is a picture I snapped of a part of the line of boxes full of buildings that are even now being packed up for dispatch. Amazing. There are more buildings here than in medieval Glasgow I think! 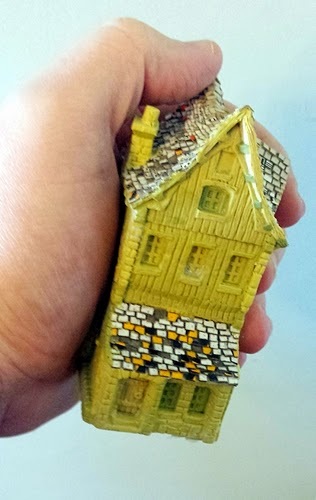 Additionally the image I have used here is of my own hand holding the original sculpt for HOB1D Tall House. 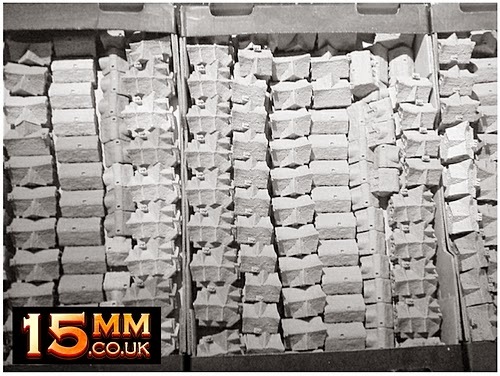 We have been asked many times over the last ten days for an article showing the original models created by our lead designer Sam Croes as some people don't believe they were not 3D printed. They were not. They are hand crafted. Article coming after release with a lot of pictures for you to see. These buildings are excellent for any 15mm fantasy system and indeed also for any 15mm system for wargaming that ranges from medieval to renaissance or dark age in terms of the hovels. Very versatile and durable too. These little lovelies will last for eternity. The HOB Range will be expanded with more codes soon and expect news of this here on the blog. What is coming next....well something that Humans always fight against in any fantasy system. Thanks Ivan. Yes, its still ongoing and will be all weekend and from there too. A long line of boxes. We are very happy with the result and more work is underway on more designs too. Hi Gavin, received my buildings this morning. They are breath-taking, I really can't believe how much detail you've put on each model. I wish you every success with this range as it will be well deserved. I can't wait to see how you expand this range over the coming months. Thanks Peter for your comment. Its very touching that you took the time to say such kind things. It means a lot to us here that you like them. The range is being expanded and will end up very large just like the HOT range is. I have receveid mine this morning. Great job! Hope I have talents to paint they with a nice appearance. Hello Stephane. Thanks for letting us know you got your buildings and for the kind words. When you paint them please do email us with some photos. More news on buildings real soon! Lovely work Stephane! I look forward to seeing all of the buildings painted up by you.